You may have noticed a dropoff in my posts in the past month and I wanted to explain. My grandfather -- or, as I lovingly referred to him, Papa -- passed away on June 5 at the age of 90. The next day would have been his 65th wedding anniversary. I've found it quite difficult to speak about my grandfather since he died without my throat becoming tight and tears welling up. We were very close -- I was the only granddaughter, or, as he always referred to me, "his favorite granddaughter." And, yes, I suppose he spoiled me because of this -- but, really, it just meant we had a very special relationship. My Papa was an extraordinary man. Throughout my childhood, he was there on a daily basis. He helped raise me and shape me into the person I am today. 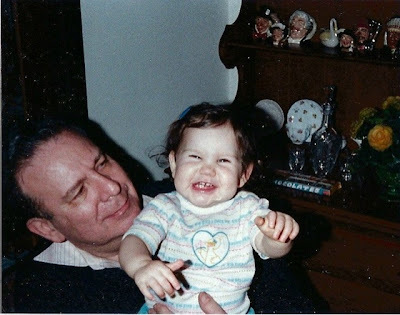 He picked me up from school every day, had our family over for dinner multiple times a week, never missed a single performance of mine (and there were many, as I was involved in countless theater productions and choirs over the years). He and my grandmother even drove to Cincinnati my senior year of college to watch my choir, The Singing Hoosiers, perform with the Cincinnati Pops, on the off chance I would be singing a solo that night. (I was.) When my brother and i were growing up, Papa took us on what he liked to call "jaunts" -- sometimes a trip to the bookstore (where I could pick out three different books to take home) or sometimes the toy store (my Barbie collection flourished since I could pick out one Barbie and two outfits for her on these trips). Regardless, we would finish with a trip to what we called "the fancy McDonald's," gorging ourselves on French fries, sundaes and soda -- the latter of which he would ask us to share by means of, in his words, "taking a slug." He was a master teacher in the Cleveland's Shaker Heights school district for over 30 years, and we couldn't go anywhere without one of his former students coming up to us to tell him he was their favorite teacher. I was flabbergasted when, at his funeral last month, students from as far back as the 60s came. He had a profound impact on so many lives, and I am so thankful for that. Papa is my first grandparent to pass away. I know that I'm extremely fortunate to be 33 and just experiencing loss of this degree for the first time. And I know that I'm actually even more fortunate to be feeling so heartbroken. But it doesn't make the pain or loss any easier. I am most saddened by the fact that I will never hear his voice again, and I worry that over time I'll forget the sound of it. Thankfully, though, he often spoke in what my brother has been referring to as "sound bites" -- he had so many words and phrases with unique inflections and also made up many of his own. So I've been playing those on a loop in my head, trying desperately to seal in the sound so I don't forget later in life. I hope that my Papa has found peace now that he is at rest. And maybe, just maybe, he's taking a slug of someone's soda right now. I was very touched by your posting, and let me give you my condolences. Although my Mother passed away 11 years ago, at times it seems like only yesterday. Since you two were so close, I do have some advice to help with your healing process. Keep yourself open to different sights, sounds, and smells around you. Your Grandfather will be sending you signals to let you know that he's fine. Perhaps you'll smell something out of the ordinary that reminds you of him that comes from nowhere, for example, or a light that turns on by itself. I received so many signals from my Mother, and still do to this day. These signs have given me comfort, since I miss her so much! !